News & Events — Can't Read, Can't Write, Here's My Book. A lot of exciting things have been happening since Michael launched his book in June 2018. This page is for documenting those experiences and sharing all his accomplishments. March 2019 – Meeting Ellen! In the Month of March a dream came true for Michael, he met one of his idols. Michael has always been a fan of Ellen Degeneres. Her commitment to spreading kindness in the world and being yourself has always inspired Michael—plus she is pretty funny. On March 3rd, Michael travelled to Toronto to see Ellen’s show and got to be part of a meet-and-greet before hand. He was thrilled to win these tickets from the Niagara Outlets as they recognized the impact Michael was making in his community. Michael hopes to speak with Ellen about his book and maybe one day be on her show to tell the world about it. This was a huge highlight in March and in his life. Michael also took some time off to soak up the sun and watch baseball at the Blue Jays Spring Training in Florida. The month of February was very busy. Michael used Skype to speak to a 3rd year Sociology Class on Social Movements at the University of Alberta. Michael spoke to five different elementary schools in the Niagara Region. 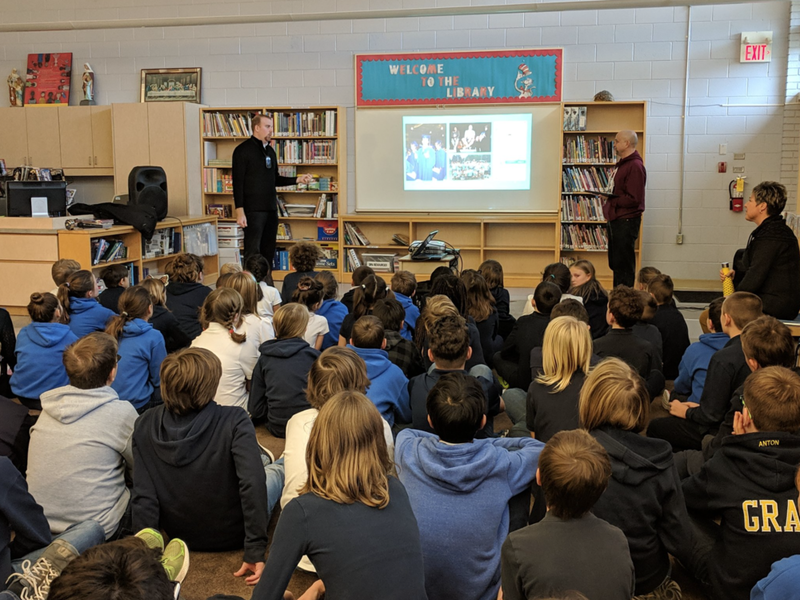 He spent three days in the Huntsville/Sundridge area speaking to elementary schools, secondary schools, parent presentations, a radio talk show, and to a local on-line newspaper called the Huntsville Doppler. On Friday February 22, Michael was welcomed as the keynote speaker for the Golden Key International Honour Society. It was their annual Canadian conference organized by the Brock University chapter. 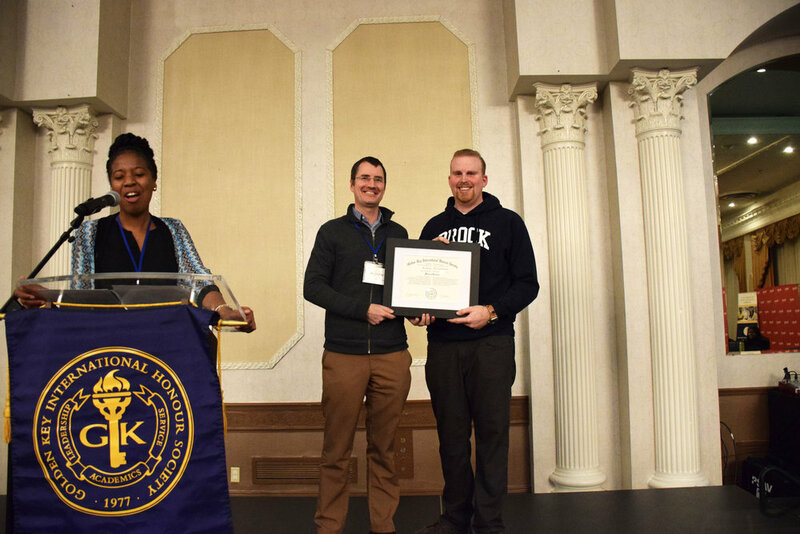 At the end of Michael’s presentation, he was made an Honorary Member of the Society. Michael was surprised and thrilled to be given this honour. Michael ended the month presenting with his sister at Cool Concept #4 at Shopify in Toronto. It is an event put on by the Toronto Design Directory and it invites creative people to talk about personal projects. The audience was laughing and in tears throughout the presentation and Michael had a great time hanging in Toronto. Michael began 2019 by donating partial proceeds of his book to Special Olympics Canada. Michael then jumped on a train and took a trip to Brockville and was interviewed during an event organized by the Brockville and District Association for Community Involvement. He continues to speak at various elementary schools across the Niagara Region. His message of inclusion and not giving up has been contagious. He had the opportunity to speak to several classes of students—who wish to be teachers—at Brock University. They have been very encouraging and supportive of Michael's inspiring story. In addition, Michael spent an evening with teachers. His strong voice and being a role model was shared as he spoke about his book/life. Michael was invited to TSN Sports Center to co-host with Kate Beirness. Together they kicked off a campaign dear to Michael’s heart. 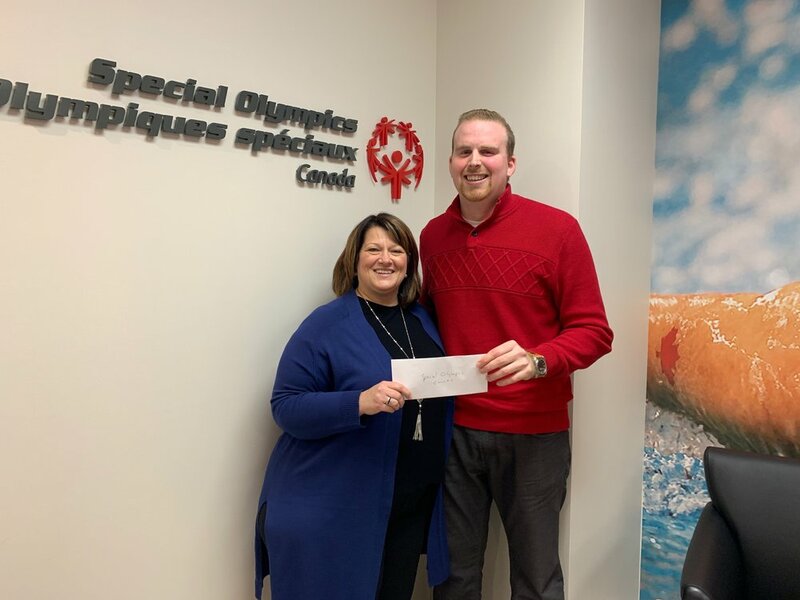 Sobeys launched a full week in-store fundraiser where you could say YES to donating $2 to #SpecialOlympics when you checked out at any @Sobeys. Everyday Michael is a proud Sobeys employee and Special Olympic athlete, and this has been a special opportunity for him to be part of. To start 2019, Michael was featured in the St. Catharines newspaper. Michael appreciates opportunities like this to get his story in front of more people. He is thankful for the kind words and to everyone who contributed to the article. Michael is determined to make a difference in the world and change the narrative of what it means to have a disability. He feels each day he is getting closer and closer to his vision of a more inclusive world. On September 20th, Michael and his sister Kaila went on Breakfast Television with Roger Petersen and Dina Pugliese. Michael had never been on live television and he was pretty nervous, but everyone there made him feel comfortable and excited. Michael and Kaila were able to talk about their relationship and the making of Michael’s book. The responses after the show were incredible! He received many orders and people were sharing their stories. It has been an experience they both will never forget. On November 5th, Michael and Kaila were welcomed on CHCH with Annette Hamm. She reached out to Michael and was very excited to have him on the show to hear more about his book. Michael enjoys television experiences as he hopes to get the book in as many hands as possible. He also feels he is getting pretty good at speaking on live television. He is grateful for all these types of opportunities. From September 11-14, Michael attended the CLO AGM in Toronto. Michael was re-elected to be on the board for another two years. Michael spoke in front of 500 people and let them know he wanted to continue to be a voice for those like him. Michael was also given the opportunity to discuss his book at the conference and sell copies. He presented a cheque to Chris Beesley (CEO of Community Living Ontario) at the conclusion of the conference, as partial proceeds of his book are donated to Community Living Ontario and Special Olympics. On Wednesday September 19th, Michael attended the annual Welland/Pelham Special Olympics fundraiser dinner held in Fonthill and sponsored by Sobeys. Michael briefly spoke to the guests about the importance of Sobeys partnership with Special Olympics. He also spoke to the significance of Special Olympics in his life and the life of other athletes like him. At the end of Michael’s presentation he gave a cheque to Special Olympics, as partial proceeds of his book are donated to Community Living Ontario and Special Olympics. On September 28th, Michael was invited to York University to speak to graduate students, research assistants, and professors about his book. His sister Kaila went to York University, so it was cool to go their with his dad and be able to present to a classroom full of people. Michael was a guest speaker at Niagara College on October 22nd. Michael enjoyed speaking to students about his experience and hopes he inspired them to make a difference in their future careers. Michael attended a Conference in Winnipeg from October 29th-31st. He had the opportunity to present with Chris Beesley, CEO of Community Living Ontario. 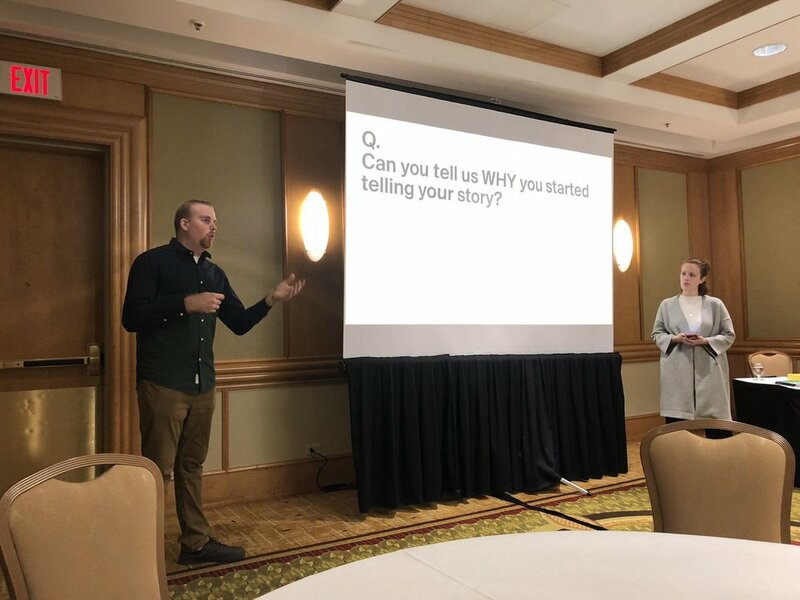 The two day conference was full of inspiring people from around Canada sharing the work they are passionate about doing. Michael presented twice in one day speaking about Re:Action4Inclusion, an amazing movement apart of Community Living. At Re:Action4Inclusion, Michael found his voice, it gave him the strength and confidence to write his book. Michael can’t wait for next years conference! On Nov. 20th, Michael had his first opportunity to speak to elementary students. It was Anti-bullying week and Michael spoke to Grade 3-through-8 about the importance of inclusion. He shared his experiences in elementary school reinforcing that being different is okay, and that everyone needs to be included. The students were very engaged, even helping Michael to read his slides, they asked lots of questions at the end of the presentation. Later in the week they sent video clips thanking him for sharing his inspiring story. On Nov. 21st, Michael was the guest speaker for the town of Fonthill's community efforts event that recognized service groups and town subcommittees. Approximately 180 volunteers listened to Michael talk about his book and his journey. The theme of the night was “Imagine, Believe, Achieve” something that resonated with Michael very much. He spoke to the importance of volunteer work as Michael is a board member of Community Living Ontario and Community Living Welland/Pelham. Partial proceeds of his book are donated back Community Living Ontario and Special Olympics as these two organizations are very important to Michael. In the photograph, Michael is with Dave Augustyn, former Mayor of Fonthill. Michael spoke to Niagara College staff and co-ordinators. He spoke with them about not being able to read or write, but not allowing that to stop him from writing a book—he was able to focus on his strengths, and was able to accomplish one of his goals (the completion of his book.) Knowing the significance in speaking directly with students; Michael offered to discuss his story with their students and encourage students to accomplish any or all of the dreams they might have. Michael would like to thank Carolyn Triemstra, the Dean of Community & Health Studies Division, for having him at Niagara College. Featured on The Lucky Few Podcast! Michael's book was mentioned on The Lucky Few Podcast where stories, interviews, and advocacy for Children with Down Syndrome are featured weekly. Episode 9, titled The Ultimate Holiday Gift Guide included Michael's book as one of the featured items to consider when buying gifts for the holidays. They described Michael as a ‘Narrative Shifter’, it was awesome to hear how Michael’s self-advocacy shines through and is impacting many communities of people. We are huge fans of The Lucky Few, check them out! On Nov. 30th and Dec. 1st, Michael and Kaila attended the CEC Annual Special Education Conference. On Friday, they gave a Poster Presentation, and on Saturday morning they shared Michael’s journey and his book. Michael provided insights on what worked for him in the school system—such as: 1) attending IEP meetings to be involved in your education, 2) being integrated into the classrooms to feel like you belong, and 3) allowing your students to fail but to always believe in them. Michael realizes that each person is unique and that teachers and EAs in schools have an important role to play by listening to their students. He was inspired by the people in the room and their dedication. He hopes this will help many other students to be successful and enjoy their school experiences. On Dec. 5th, Michael and his father (executive assistant), had the opportunity to speak to students at St. Ann Catholic Elementary School in Fenwick. Once again, by sharing his stories, Michael stressed the importance of inclusion with the students who were attentive and engaged. Michael highlighted how important accepting everyone is, no matter what challenges they may have, and to always make sure everyone feels like they belong. Many great questions were asked at the end of his presentation. On Dec 18th, Father Hennepin Catholic School invited Michael and his dad to give a presentation to their students. It was an exciting visit to the school because the students knew Michael's dad, as he was their former Principal. They even made a welcome sign out front of their school! Michael spoke to the students about the importance of inclusion and how it’s okay to be different. The students were interested in Michael’s story and asked excellent questions at the end of his presentation.